Cathay Pacific’s The Pier business class lounge in Hong Kong is now home to a dedicated yoga and meditation space, where passengers can relax and unwind before their flight. … or refine their own yoga techniques in a self-practice area, with seated stretching areas nearby: all of which are designed to improve circulation and joint mobility while relaxing the mind, the airline says. Meanwhile, The Mind Sanctuary serves as a meditation zone, either by listening-in to guided audio sessions with supplied headphones and iPads, or through gazing meditation via graphics placed on the wall ahead. As these studios now occupy space previously used as a working area with computers and printers available, those amenities have been relocated to the lounge's food hall. As part of the airline’s partnership with Pure Yoga, the design partner of the new spaces, Marco Polo Club Gold and Diamond members arriving into Hong Kong on Cathay Pacific or Cathay Dragon flights have an extra opportunity to refresh and unwind on the ground. Up to 12 times each year, these members can visit any Pure Fitness centre or attend any Pure Yoga classes outside of the airport – but of course, visits to The Body Sanctuary and The Mind Sanctuary are unlimited, available whenever visiting The Pier business class lounge. If your travels take you through Hong Kong, however, Cathay Pacific’s The Pier business class lounge welcomes Cathay Pacific and Cathay Dragon business class (and first class flyers), along with Marco Polo Club Silver, Gold and Diamond members on those same flights. It also welcomes business class and first class passengers of all other Oneworld alliance airlines – including Qantas – along with Oneworld Sapphire and Emerald frequent flyers departing on a Oneworld flight, such as Qantas Gold and above. This means that even though Qantas runs its own branded lounge in Hong Kong, if you’re flying Qantas business class or first class, there’s nothing stopping you from detouring via The Pier lounge: ditto if you’re a Qantas Gold frequent flyer or higher, booked in premium economy or economy. I believe the yoga space in the HK SkyTeam lounge has now been repurposed into extra seating. Good to see this. I would love to see more airlines adding proper gyms (with equipment and weights) into their lounges. It surprises me that there aren’t really many of these around. A workout (which in a lounge can be easily followed up with a shower and then a nutritious post-workout meal) would be my ideal way to spend a longer transit. Very good that the computers and printers have not been discarded as has occured in some airline lounges, but that they've been relocated. 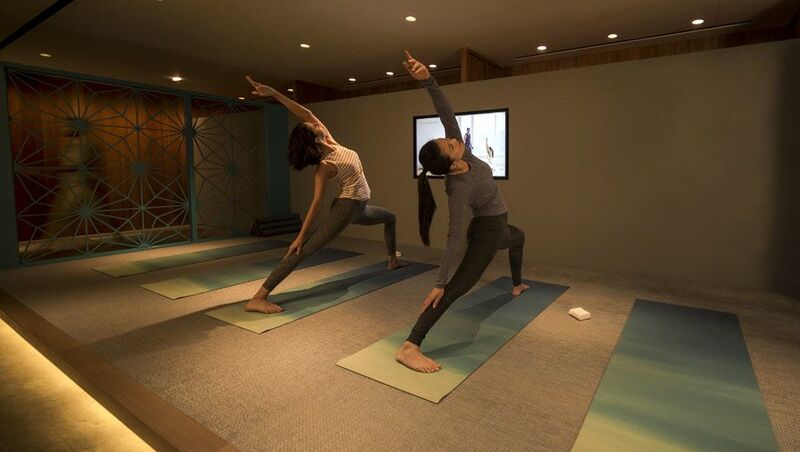 Comment on "Cathay Pacific opens yoga and meditation space in Hong Kong"